In 2005, I started my Reiki journey in Hawai’i. At the time, I was going through massive shifts in my life that left me heartbroken and shattered, so I went to see a kahuna there (a kahuna is a wise woman/shaman in Hawai’ian culture.) She told me that I was very powerful, and that I need to start doing Reiki. She also told me that Goddess Guan Yin (the Chinese Goddess/boddhisattva of compassion and love, also known as Kwan Yin, Quan Yin) was around me. Little did she know that I’ve always had an affinity for Guan Yin. So, although I didn’t know much about Reiki back then, I trusted the kahuna, flew back to the mainland, and did my first Reiki attunement. My Reiki journey continues, years later, and will continue to always be a part of my life. 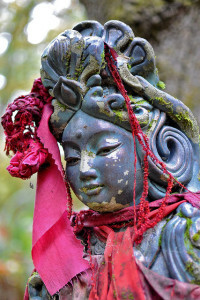 “Kwan Yin and her snail” by K. Kendall, used with permission under CC BY 2.0. Reiki is a healing technique that was developed by Japanese Buddhist Mikao Usui in 1922, and has since evolved into many practicing traditions. “Rei” is defined as the all-knowing divine universal, and “Ki” is the energy that animates all living things, and flows through everything that is alive, including plants, animals, and humans. It is used all over the world by people of many different faiths, cultures, and spiritual paths. I practice White Light Reiki. Reiki is not taught in the way other healing techniques are taught. It is transferred from the Reiki Master to the student during an attunement process, which opens the crown, heart, and palm chakras to create a special link between the student and the Reiki source. Before the attunement, I prepared my body through eating well and cutting out red meat, no sweets, increasing my meditation practice, and keeping my mind clear and my body healthy, in general. It’s recommended to not smoke or drink, but I wasn’t planning to do either anytime soon, anyways. The attunements are always followed by a twenty-one day detox that flushes toxins you’ve been holding in your body, and releases feelings and thought processes that are no longer useful. I’m still going through that part now. It’s been intense, but I’m loving every minute of it! So, what started out as a quest to heal my heart, has become a practice that helps me soothe my body, soul, and spirit, and also allows me to share that, and the healing effects of acupuncture, with others for a living. When you follow your heart calling, only good can come of it! What is your heart calling you to do? For common questions about reiki, check out my “What Is Reiki?” page. Copyright © 2012 by Alcantara Acupuncture & Healing Arts. All rights reserved. You may quote, copy, translate and link to this article, in its entirety, on free, non-donation based websites only, as long as you include the author name and a working link back to this website. All other uses are strictly prohibited. this. You must proceed your writing. I’m confident, you have a huge readers’ base already! Thank you, reiki healing! I appreciate the encouragement and supportive comments. May your reiki healing work in the UK continue to flourish! Congratulations on your recent Reiki attunement! All that you’re explaining is totally natural and to be expected, since you’re still learning how to get a good grasp on how energy works, and how YOU do Reiki. I commonly hear this complaint from Reiki students, particularly who’ve finished Level I (and even II and beyond) – not feeling confident that it’s flowing through you, simply because you don’t see instant physical manifestation of your handiwork. You will soon see that there is often a physical manifestation or “evidence” that happens sometime down the road, which you may or may not witness. And, sometimes there is evidence that is not physical or easy to see, because the shifts are made deep within, and then radiate outwards to those your client connects to. Trusting your Third Eye is a process. I encourage you to allow yourself to hone it in your perfect timing. Keep practicing it on yourself (and on close friends and family).